The drama of Tel Aviv history continues! If you are not an avid history fan (like me), you may prefer to skim through the headlines and catch the essence of the Tel Aviv story. During the Byzantine Period and early Middle Ages, Jaffa was a flourishing port town and commercial center. 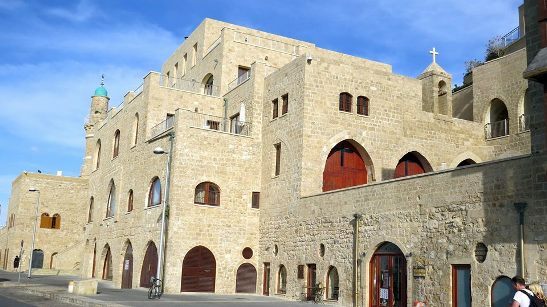 Sometime in the first millenium, St. Nicholas's Monastery was built which still stands in the Jaffa Port area. 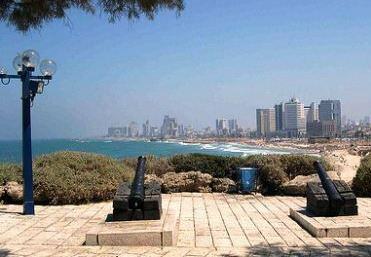 First... Jaffa was conquered by the Arabs in 636. Under Islamic rule, it served as a port for the Islamic capital of nearby Ramla and the number of Jaffa residents decreased sharply. Then... the city was captured in 1100 by the Crusaders who revitalized Jaffa under the Crusader Kingdom of Jerusalem which lasted for nearly a century. In 1187, Saladin and his Muslim armies reconquered Jaffa back from the Crusaders. But at the famous Battle of Arsuf in 1191, the city surrendered again to the Crusaders - under King Richard the Lionhearted from England. After a 3 year truce under the Treaty of Jaffa in 1192 between Christians and Arabs, the Egyptian Muslims reconquered Jaffa. These repeated battles left Jaffa much the worse for the wear. Once again... in 1330 the city was completely destroyed by the Muslims who feared the coming of another crusade. In 1515, the Ottoman Empire conquered all of Israel (then called Palestine) including Jaffa. This marks the beginning of 400 years of Turkish rule in the region until WWI. Gradually, the city was rebuilt. In the 1700’s, Jaffa was a mixed settlement of local Muslims, local and European Christians and Jews. Later in the century, the Jaffa coastline was attacked repeatedly by pirates and many of its residents escaped to Ramla and Lod. Even Napoleon Bonaparte is part of Tel Aviv history. 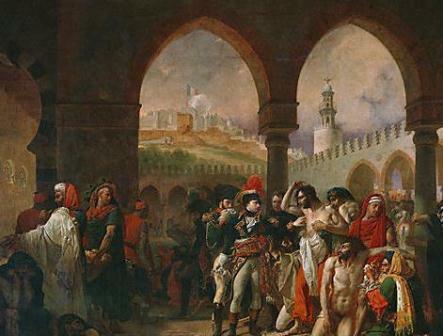 In the bloody Siege of Jaffa of 1799, Napoleon destroyed Jaffa and killed hundreds of its inhabitants. You can still see a few Napoleonic cannon on display. Napoleon’s influence on Tel Aviv history was short-lived. Within months, the city went back to Ottoman rule. Unfortunately, Napoleon’s main influence on Jaffa was especially deadly one. His soldiers inadvertently brought an epidemic to the city which killed hundreds of locals. Normal life in Jaffa was reestablished in the early 1800’s. In the 1820’s, the governor Muhammad Abu-Nabbut began a massive restoration of the city and built the Mahmoudiya Mosque. 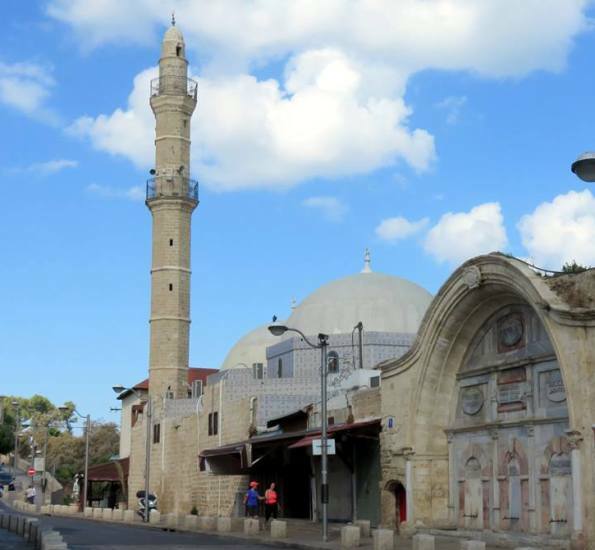 It is Jaffa's biggest mosque and continues to be in use today. Despite a brief and violent interlude of Egyptian rule by the ruthless Ibraham Pasha, Jaffa grew and prospered. In the late 1800's, a group of American Christian colonists moved to Israel bringing with them modern agricultural techniques. Sadly, the colonists didn't last long in Israel, but their influence remained. You can visit the quaint American Colony of Tel Aviv. Besides the American colonial buildings which remain intact, their influence on the local citrus industry remains to this day. The Jaffa port became a center for exporting the well known "Jaffa Oranges" which became one of the most popular orange species worldwide. 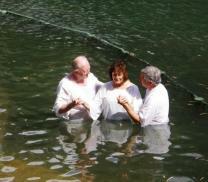 The American colonists didn't remain, but the Templars who arrived from Germany in the 1860's did. 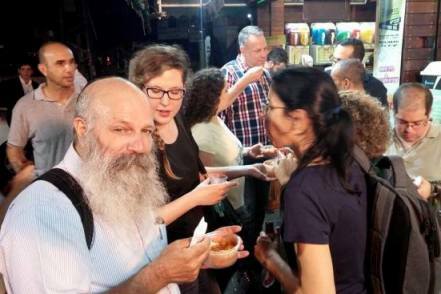 They left their neighborhoods all over Israel, the most famous today is the Sarona neighborhood in the heart of Tel Aviv. Besides beautiful architecture, the Templars also developed industry and modern agricultural methods to the area. Jaffa and its outskirts began to thrive. Due to the growing wealth of the city, there was a large influx of Arabs from Egypt and other countries. 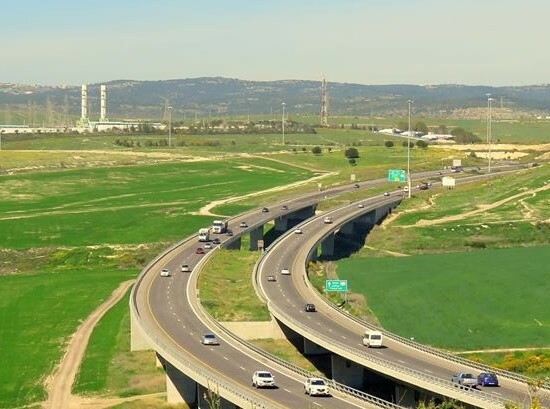 Arabs created new neighborhoods in Ajami and Menashiya. In 1820 Sephardic Jews began immigrating to Israel and settled in Jaffa. Later in the century as part of the new Zionist movement, Jews from other countries arrived as well. 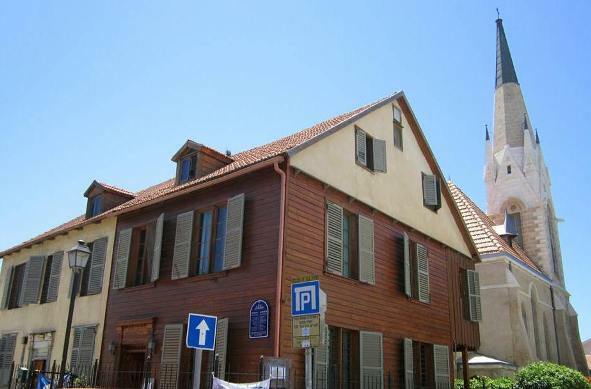 New Jewish neighborhoods were established just outside Jaffa such as Neve Tzedek and Florentine. 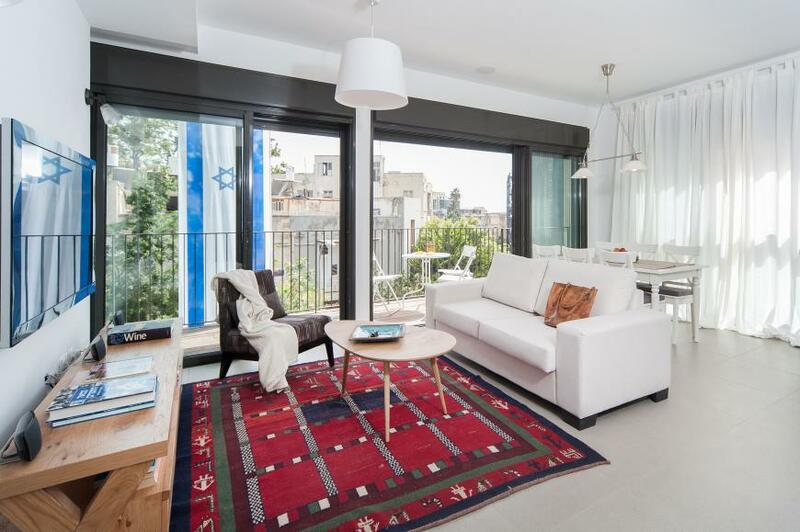 Revitalized Neve Tzedek retains a 'village' atmosphere even today. 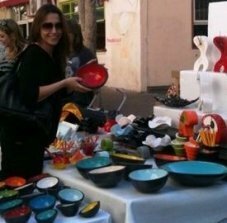 Read more here about Neve Tzedek and other Tel Aviv neighborhoods. Yemenite Jews settled in the late 1880’s in 'Camp Yehuda' whose name was changed years later to Hatikva. A bit later, the Kerem Hateymanim Yeminite neighborhood was built. You can still enjoy delicious Yeminite food there today. The first railway to Jerusalem was inaugurated in 1892. 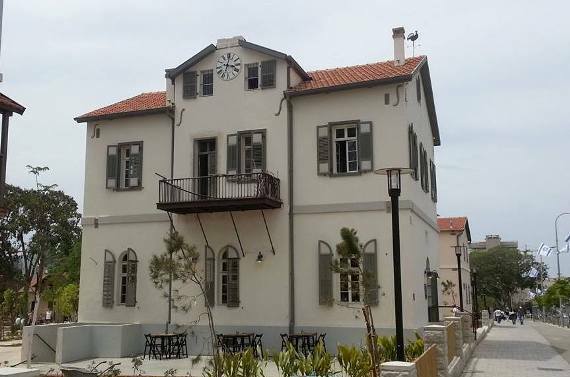 This same old train station has been recently restored and is part of the picturesque Hatachana station complex in southern Tel Aviv. You can read more in our page on HaTachana - Tel Aviv's Old Train Station page. Near the turn of the century, Jaffa's city walls erected many hundreds of years earlier had to be dismantled due to overcrowding. The 20th Century ushered in dramatic developments that affected Tel Aviv history. In the late 1800’s, Jews began immigrating to Palestine as part of the Zionist movement to rebuild a Jewish homeland and refuge from the vicious anti-Semitism in Europe. The port of Jaffa was their main entry point. Most continued on to agricultural settlements and kibbutzim, but some stayed in Jaffa. At the turn of the century, Jaffa was extremely overcrowded and dirty. Moreover, a Turkish decree forced Jaffa Jews to move their living quarters once a year! Fed up, 66 Jewish families from Jaffa decided to leave the harsh conditions there in order to start a new neighborhood. In 1909, they bought a plot of land in the sand dunes near the sea from the Bedouins, about 15 miles (25 kilometers) north of the city. They dreamed of building a modern city with street lighting, running water, flower beds and playgrounds. 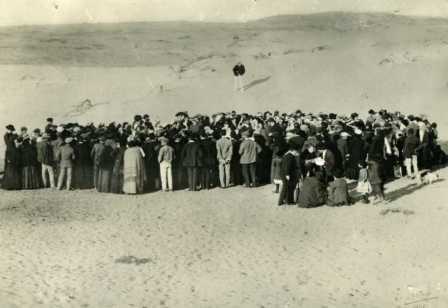 You can read more about the Seashell Lottery that helped found modern Tel Aviv. Originally called “Ahuzat Bayit’ or “Mansion Manor’, the neighborhood’s name was changed to Tel Aviv, or (Ancient) Hill of Spring. 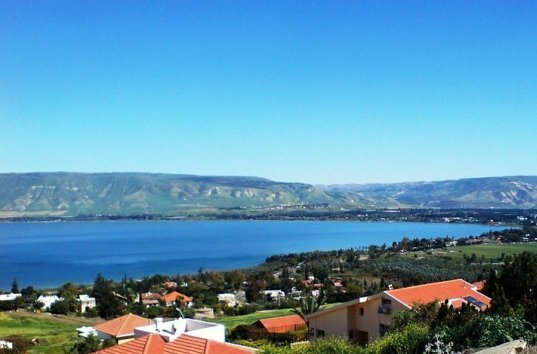 The name comes from the title of Theodor Herzl's famous book on the Zionist dream. Herzl was the most important founder and leader of the modern Zionist movement. In the meantime, Jewish immigrants continued to stream in to the country, in fulfillment of Herzl's dream of returning to the Jewish homeland. During World War I, the brilliant Field Marshal Allenby defeated the Turkish Ottomans who were allied with the Germans. All of Palestine including Jaffa fell under the British Mandate. The British rule, coupled with the increased Jewish immigration caused Arab discontent. In the 1921 Riots, Arabs attacked and killed Jews in Jaffa and other cities. Thousands of Jews fled Jaffa for Tel Aviv. Then in 1936, the Great Arab revolt began in the Jaffa Port. Arab rioters ran away from the British in the byzantine maze of Jaffa's streets. After issuing an evacuation warning, the English blew up homes and destroyed parts of the old city in Operation Anchor. In order to calm the mood in the Arab street, the British decided to greatly limit Jewish immigration to Palestine. To deal with the growing stream of refugees escaping the Holocaust, the Jews set up ‘Aliyah Bet,’ the code name for the huge underground enterprise that illegally brought hundreds of thousands of Jewish refugees escaping from Nazi Europe to Israel. My father, Abraham Rozenzveig was one of those Jewish refugees. His dramatic story is a common one. After losing his entire family in the holocaust as a child in Belarus, he sailed from Italy to Palestine on an illegal refugee boat called Mordei HaGetaot, or "“the Ghetto Resistance”, organized by the Aliyah Bet. You can see him here in the photograph, a bare-chested 14 year old in the middle of the bottom row. The photo was taken after the boat was captured a few kilometers from shore by two British warships who rammed the boat from each side. He remembers how they all stood up and sang in defiance and pride the Hatikva anthem. After a 3 hour 'battle' fighting tear gas and water hose with bare hands, the Jews surrendered and were moved to prisoner boats and deported to British Prison Camp 55 in Cyprus. Some months later, in honor of King George's birthday. 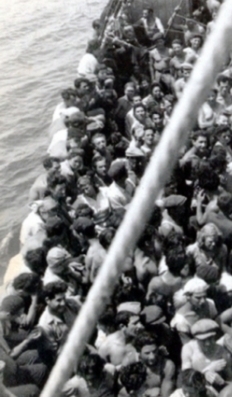 500 Jewish orphans were allowed into Israel, including my father. By 1947 Tel Aviv's population reached 200,000, less than 40 years after 60 families bought a plot of land. The end of WWII brought the end of the British Mandate. In 1947, the United Nations voted in favor of a homeland for the Jews by partitioning Palestine into two states, one for Arabs and one for Jews. On the 14th of May, 1948, the State of Israel was declared by David Ben Gurion in Tel Aviv. You can see and hear his declaration in this video, with English subtitles. The Israel Independence War was fought between Jews and the local Arabs who were supported militarily by all the neighboring Arab countries. 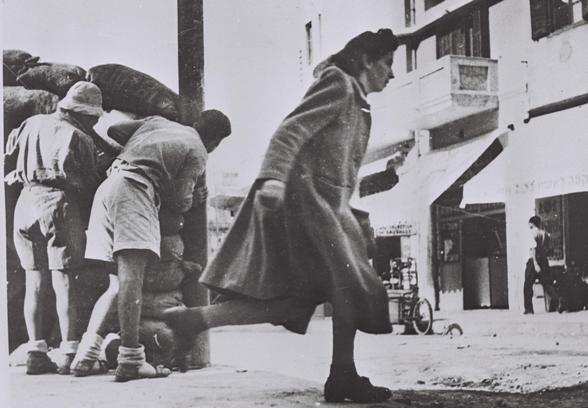 In the photo you can see residents of Tel Aviv taking cover from Arab sniper fire in Tel Aviv during 1948. Ultimately, Jaffa surrendered to Jewish resistance forces on May 1948 and 90% of the Arab population escaped to Arab countries. 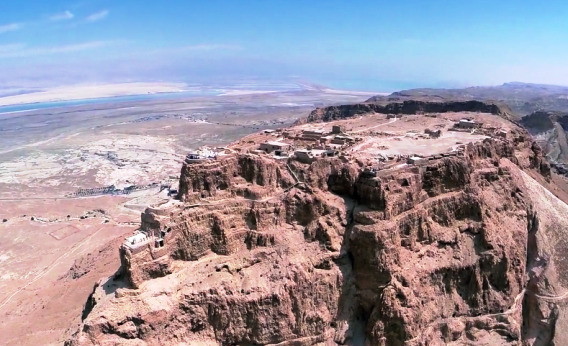 A year later, Jewish history came first circle and Israel declared Jerusalem as its capital, as it was under the Kingdoms of Israel and Judah in antiquity. In 1950 Jaffa was unified with Tel Aviv to become the single city of Tel Aviv–Yafo. In the 4,000 years of Tel Aviv history, the region was conquered countless times by different nations. Thanks to the natural harbors, the area of Tel Aviv was a commercial center throughout most of it thousands of years of history. Egyptian Pharoahs transported grain from Canaan to Egypt, Jewish Kings imported wood from Lebanon and goods from Jaffa to Jerusalem, Assyrians imported amphora from Lesbos, Philistines imported Phoenician pottery and Arabs and Jews exported Jaffa oranges 100 years ago. 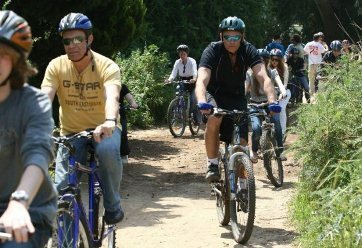 Today, Tel Aviv is the thriving business, technology and cultural capital of Israel, even though its ports are no longer active except as recreational centers. The greater Tel Aviv area including its suburbs, (called Gush Dan after the area of the tribe of Dan), numbers 3.3 million. 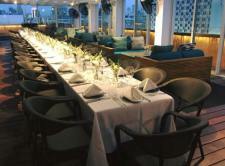 Sip a glass of wine in the modern Tel Aviv Port near the remains of the ancient Assyrian fortress of city of Qudadi. Tel Aviv’s history is an integral part of this city’s fabric.